For nearly any space in the home, you can find dozens of creative mirror ideas. Why are there so many mirror decorating ideas? Probably because a mirror is much more than a way to sneak a peek at your hair or the tuck of your shirt. With the right mirror and placement you can work magic – make a space look bigger or more open, or create more light in a room. And we could all use a little design magic. Mirror styles run the gamut from traditional to ultra-modern. Antique style mirrors are often silvered mirrors that have the appearance of wear, or they may incorporate ornate gold frames ranging from Rococo to Baroque. Rustic mirrors have a simpler farmhouse appeal. A modern mirror may feature a mirrored frame. Whatever the style of your room, you can find a type of mirror to reflect it. Decorative mirrors come in all shapes and sizes: round, oval, rectangular, square, and decorative shapes like starburst, hexagon, or quatrefoil. Every shape carries some meaning, which adds a bit of spice to your decorating. Below are just a few of the possible shapes and sizes, as well as creative mirror decorating ideas for each. Large round mirrors offer a lot of flexibility and look great over a mantel or console or even over the vanity in a bathroom. Horizontal rectangular mirrors work well on a dining room wall or behind the sofa. Large oval mirrors can fit well over a bed horizontally, or vertically over a console in the entry way, where there may be little light. Small mirrors are often best hung gallery wall style. Create a salon wall of mirrors, hang them suspended in a group of three, or use one as a central element in a mixed collection. Large rectangular floor mirrors can add drama when rested on the floor in a living room, entryway, or hallway. Bassett’s oversize Stone Creek Mirror, a 7’ rectangular mirror, creates an impressive room element. On a wall without a window, a large mirror becomes another window, adding a view and light, especially when you place the mirror opposite an actual window. Starburst mirrors have been around for hundreds of years, and became especially popular as a mid-century modern accent. A fresh take on a starburst mirror like Bassett’s Glendale Mirror takes the style from traditional to modern. Quatrefoil mirrors become more than just an interesting shape in a French inspired room. Abstract shaped mirrors become a bold focal point of the room. Since they draw attention, hang an abstract mirror as art over a fireplace mantel or reflecting the chandelier in a dining room. Whatever shape and size of mirror you choose, make sure it is proportional to the wall space you have available. If you love a mirror but it doesn’t seem big enough for that wall behind the sofa, consider repeating two or three of the same shape next to each other. Full length mirrors, which are handy for dressing, or can be hung behind the bedroom door if you don’t have room elsewhere for it. Matching mirrors hung like art above each nightstand. A dramatic mirror or a group of three suspended above a headboard as a focal point. When decorating a bathroom, a mirror over the vanity is a must. How you use that mirror to inject some personality into the bathroom is up to you! If you have a double vanity, opt for two large mirrors rather than one gigantic mirror, matched to create symmetry. Decorating with mirrors quickly brings light and style to nearly any area in the home. 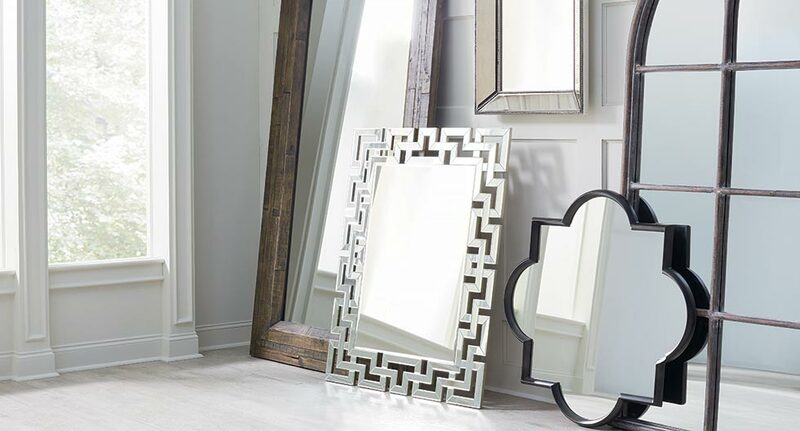 Shop the Bassett Furniture mirror collection to find a beautiful decorative mirror just right for your space.